My Day in K and Teach. Talk. Inspire! 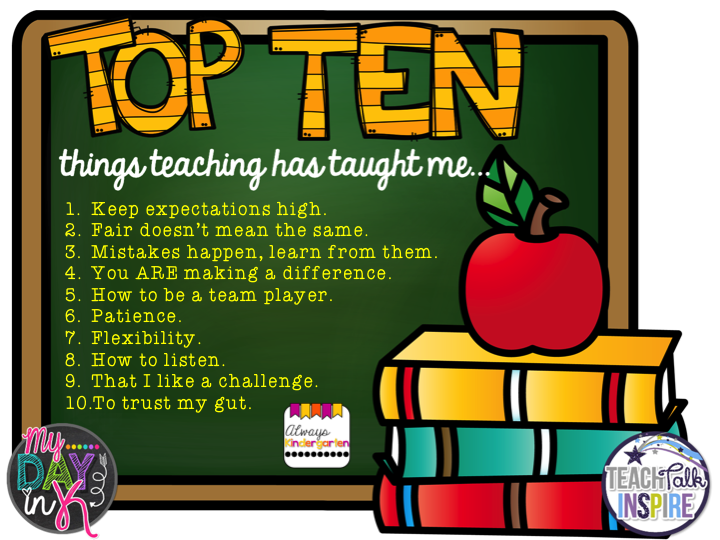 1) Keep expectations high: High expectations for students shows them that we believe in their abilities. We need to teach with support, kindness and purpose. High expectations for ourselves models this for our students as well. 2) Fair doesn't mean the same: It means everyone gets what they need to be successful. I'll never forget the first time I heard this. But it is so true. We differentiate instruction to meet the needs of our students for a reason. People are different and everyone needs different things to be the best they can be. 3) Mistakes happen: We're human. We make mistakes. The important thing is to learn from them. So that lesson bombed. Ok. You're fine, your students are fine, make adjustments and come back tomorrow and try again. 4) You ARE making a difference: even if you don't see it. Sometimes we struggle with a student or a class and we get down on ourselves. But the truth of the matter is, we ARE making a difference in their lives. We may not see the progress we wish we could. We may not get the validation in a way that is tangible. But in the heart of that child, we've made a difference. 5) How to be a team player: Collaboration and teamwork are at the core of what we do. As teachers we learn so much from each other. Building meaningful connections and feeling like a valuable part of the team can help reduce the stress of being a teacher and trying to do it all on your own. We need to support each other and build each other up. We are in this together! 6) Patience: Learning takes time...especially in Kindergarten! We have to teach things over and over and over again. Our students will test us, push our buttons, and sometimes drive us batty! ;) But that's their job. Patience is key even when it's really hard. 7) Flexibility: I've always thought there should be an Improv class taught in teaching credential programs! As teachers, we are planners. But how many times have we had to throw out a lesson because it wasn't working, change our schedule due to a last minute assembly, cancel that outdoor activity because it started raining, run out of time due to a fire drill and the list goes on. We have to think on the fly and just go with the flow. 8) How to Listen: Sometimes I talk too much. But what I've learned is that if I let the kids do the talking and really listen, they learn from each other and teach me so much, too! I have to remind myself to shut up be the listener sometimes and let the children do the talking. 9) That I like a challenge: This was a big eye opener for me. I'm a planner. I don't like surprises. I like to know what's coming and prepare for it. But, I also LOVE a challenge. Have a student with behavior challenges? I want 'em. Have a student struggling to learn? Give 'em to me. Multiple IEP's? I'll take 'em. It's hard. It's a challenge. But I will take it on. It's what drives me as an educator. 10) To trust my gut: Education is always changing. There will always be new curriculum, new standards, new ways of doing things. If something seems awful, don't stress too much, it will change soon and something new will replace it. What's most important is to trust your gut and do what you know is best for YOUR students, not what someone else tells you that you should be doing. I'm extremely lucky to have a very supportive administrator who respects me as a professional and allows me the freedom to teach what I know is best for my students. If this isn't your situation, then do the dog and pony show, close the door, and do what you know is right. Trust your gut. If it doesn't feel right, it probably isn't. Thanks for hanging in there and reading through this novel I've just written! What has teaching taught you? Comment below or link up with Diana and Jayme! Great list!!! Being flexible and being a teacher go hand in hand! It is so important to remember that we are making a difference even when we don't always feel like it! Thanks for sharing! This is an awesome post for a new teacher to read or just any teacher who needs a reminder of why we do what we do...it's more than just a bad moment we may have had in the day or with a student/parent/colleague. This is a totally Pin-worthy post! Hi Andrea! I love love love your list! So many true and important points about what it means to be a teacher and how hard it is. I loved how you said that we make mistakes, we're human. It's so true and for new teachers it's a hard lesson to learn! Thanks for linking up with us and sharing your thoughts! Have a great day! I love your list Andrea! So true on every level! We are just people and we will make mistakes just like everyone else:) I also believe we should set high expectations for our kiddos they will rise to meet them everytime! Thank you so much for sharing! Andrea you have such a great list!! 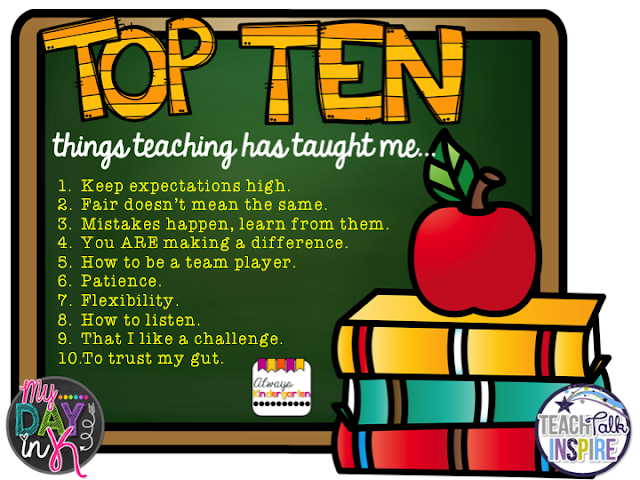 I couldn't agree more with your top ten!! Especially that fair doesn't mean everyone gets the same, and how important it is to be patient and trust your instincts! Thank you so much for sharing such a great list! Hi Andrea, I am Indrea with an "I". First of all love the colors on your blog. Enjoyed reading this post. Connecting from the CA FB Tribe. I will be checking in often.